After another deflating setback to one of the worst teams in the NHL, the Wild doesn’t have much time to regroup. It hosts another struggling club, the last-place Kings, Tuesday at Xcel Energy Center in the second half of a back-to-back. The Wild dropped its second straight and third in the last four games Monday in Philadelphia when it was upended 7-4 by the Flyers, who had won just once their previous 10 games before taking on the Wild. Goalie Devan Dubnyk surrendered five goals on 20 shots before getting pulled after the second period. Backup Alex Stalock came on in relief, giving up one goal on six shots. Stalock was poised to finish off the back-to-back Tuesday but after playing Monday, it’s unclear if that’s still the Wild’s plan. The team did not hold a morning skate ahead of facing the Kings. This is the start of a three-game homestand for the Wild before it returns to the road for two games ahead of the All-Star break. The team has won just once in its last six home games, slipping to 11-8-3 in St. Paul. But the Wild has had success this season against the Kings; in the two previous meetings, the group outscored Los Angeles 7-2 in corralling two victories. It’s also in the midst of a six-game point streak vs. the Kings at Xcel Energy Center. What’s more, the Wild has actually been better in the finale of a back-to-back than the opener. The loss to the Flyers dropped the team to 3-5 in the first test, while it’s 4-3 in the second. 4: Points for captain Mikko Koivu this season vs. the Kings. 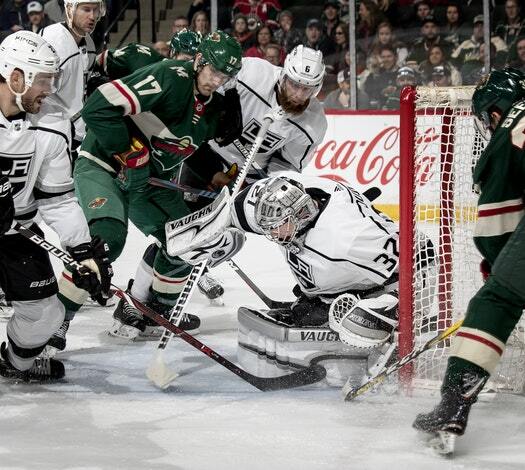 7-1-4: The Wild’s record in its last 12 games against Los Angeles. 3: Assists for winger Zach Parise in his last three games. 301: Career wins for Kings goalie Jonathan Quick, which is tied for the fourth-most in NHL history among U.S. born goalies. 374: Consecutive games played by Los Angeles defenseman Drew Doughty. Los Angeles dropped to last place in the NHL after Philadelphia’s win Monday over the Wild. The Kings are 18-25-3 and 5-5 in their last 10 games. They’re coming off a 5-2 win over the Penguins Saturday. The team has struggled on the road this season, going 7-12-2. Captain Anze Kopitar leads the group in goals (13) and points (31).